Originally, my plan for Illustration Friday was to do something with the skyline of my city Rotterdam. With quite a few landmarks, beautiful bridges and great architecture, Rotterdam has got a spectacular skyline. And frankly, I had nothing to add. 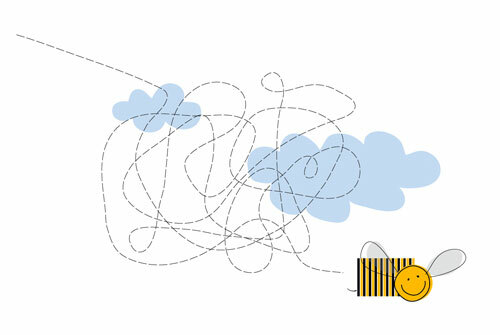 So I came up with this alternative; a buzzing bee leaving his own skyline. goede morgen! very nice drawing! simple but.. speaking! thanks for visiting by! greetings from indonesia. Cool concept that is quite different. I have a thing for bees so I especially liked your subject matter. :-) Thanks for your comment on my “skyline”. Lovely little bee – he must be a little dizzy, isn’t he? hola…me encanta la sencillez y la limpieza de tu trabajo…es una imagen super pregnante a pesar de contar con pocs elementos….me gusta…y me encanta la abejita.